That rock pigeons, actually closely related to doves, might be considered loathsome unless they are being exploited for the public’s entertainment compelled me to write my column about these resilient, fascinating birds. When I walk around New York City alone, I always notice what the pigeons are doing, bobbing their purple heads everywhere I look. These birds, once described as “rats with wings” by Woody Allen, have a harder life than people realize and should be appreciated more. Like rats, they’re sometimes associated with grime, overwhelming numbers and spattering parked cars and window sills with droppings. But, often grouped together in flocks, pigeons are docile, monogamous birds, spending their days eating all the seed, fruit and discarded food they can locate in urban landscapes, minding their own business. Fortunately, some city residents and tourists really like them, and some are even devoted to feeding them. Interestingly, pigeons are highly respected by tourists in Venice. Feeding them in St. Mark’s Square used to be a “must do” on a trip to Italy. But when I visited Venice, Italy in May 2008, the mayor had just banned grain vendors from selling bird seed in the Square – ending a century-old tradition and ultimately robbing 20 million tourists each year of the experience. Venice had long been concerned with the damage caused to historic buildings in the square by pigeon droppings. In 2015, a tourist posted on a TripAdvisor site that feeding pigeons in St. Mark’s Square was “a wonderful photo opportunity.” In contrast to the affection tourists appear to have for these birds, Venice officials admit to capturing and killing an estimated 12,000 pigeons each year. 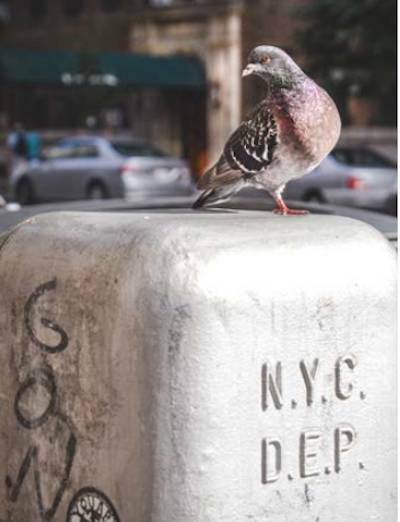 Did you know that the lifespan of New York City-dwelling pigeons is only three to five years, as they and their offspring are killed and eaten by a battalion of urban predators? Peregrine falcons, who are listed as an endangered species in New York State due to pesticide use in the 1960s, are making a comeback, and they identify pigeons as prey. New York City has the largest urban population of peregrine falcons—small beautiful birds, the size of a crow—who nest on bridges and tall buildings, and live as long as 20 years. Although peregrine falcons and red-tailed hawks prey upon all kinds of birds and rodents, their diets consist mostly of pigeons. Approximately 24 percent of New York City’s area is park land, so red-tailed hawks can be seen gliding over the trees in parks and throughout the city all year long. Each spring, in each of New York City’s boroughs, a dozen or more pairs will nest – sometimes raising their young on buildings. Speaking of NYC’s avian treasures, birders have also spotted Cooper’s hawks, barn owls, great horned owls and eastern screech owls. A photographer who takes photos of urban hawks—you can view them at urbanhawksblogs.com—keeps track of where they’re seen and shows photos of urban hawks and other wildlife in Central Park and throughout New York City. One nice series of photos features a great horned owl roosting in a Hemlock tree in Central Park just this year. Sadly, poisoning rats and pigeons isn’t just horrific for them. Poison also victimizes raptors when they ingest poisoned birds and mammals. Even in highly developed areas like Washington, D.C., or Chicago, there are plenty of trees that attract hawks and owls who feed on pigeons. And scavengers abound – rats, cats, raccoons, foxes and opossums quickly clean up dead or dying pigeons so that city streets never show their remains. Despite an array of predators, and the bird-control industry’s contraceptive bait, or the use of spikes, nets and shock tracks to keep pigeons from roosting in undesirable places, they have managed best to thrive in urban environments, and that’s admirable. Elsewhere, as cities like Los Angeles have continued to sprawl, coyotes have adapted and become city-dwellers who mate and raise their families in neighborhoods – crossing freeways, and avoiding conflicts with humans. These wild dogs eat a wide variety from insects, reptiles, fruits, birds, rodents, rabbits, small dogs and cats to garbage. If pigeons and coyotes couldn’t adapt and were driven only to the periphery of our cities, we would become more estranged from wildlife than ever. The absence of animals from our lives only produces an intolerance – an entitlement that humans come first and no other species should inconvenience us, and that is unacceptable. In part because of climate change, which expands the range of birds and animals, and the lure of food available to urban wildlife in cities, we simply must come to grips with how to live with wildlife neighbors. Whether it’s dealing with resilient coyotes, pigeons, or others, there’s lots of them. We should appreciate this life more, and clean up after birds, if needed, rather than expect them to vanish. It’s actually heartening that cities jammed with so many people can feature an array of fascinating birds and animals who, like us, are just trying to cope and thrive in this mystery called life.